If you are seeing this note, this is because my journal is mainly friends locked. If you are simply tracking something down of a creative variety, please be assured that all fics, icons, videos, banners, etc. will remain public. If you want a quick way to access fics/drabbles/vids you can do so via my memories. Real life episodes, writer's angst & character love, general tv show adoration, and all things not of the creative variety are now going to be marked Friends Only. If you want to read my ramblings please comment to be added. tell me who you are, how you know me and why you're adding me if you want to be added back. So here we go, I can finally show you all now what I was working on so diligently earlier this year. My aim was to have an upbeat party-style vid to suit the atmosphere of the con, and it quickly broadened from Jeffster to Morgan and the rest of the crew from the Buy More. I've tried to factor in as many Buy More peeps as I could (even *I* was surprised to discover there's actually regulars in the extra cast). This video won first place at Starfury's T3 convention (celebrating Chuck and Terminator: The Sarah Connor Chronicles). Okay, finally, only took me a whole night for rendering and uploading. Thank heavens for my vidding program's "upload to Youtube" feature working because the 3 times I tried to make this an avi file it did not want to work (& do not know why, my Jeffster vid rendered as an avi fine). So I was adamant about doing several a Being Human fanvid and I had almost a whole soundtrack of songs to choose from, but this little gem from havens's brilliant fanmix struck the mightiest chord and voila - a Mitchell/Annie fanvid detailing their friendship & relationship. I did initially have a different idea of how I was going to approach this one, but looks like my own style remained, although I got to play with colour curves this time which made for some interesting (and sometimes helpful considering how dark the show became) effects, so I have at least retained that "something different each vid" approach. ALSO total kudos to the directors of the show - I've never been able to work with imagery so easily since the early days of Heroes. Okay I'm going to make a completely public post because I need as much help as I can get. Other than Twilight, can anyone tell me what other vampire-related novels they have read (title/series and author) currently in the marketplace and give me an uber short rundown on what they're about (ie. Is it set in a school? Is it about a mortal hooking up with a vampire? Is it about a vampire teaming up with a detective/someone on the police force to solve a case? etc. etc. - you don't need to go into too much detail). Basically I need to know what I'm competing against (ASAP at that because I need to whip up a letter mentioning the most prominent ones in it), and as I am quite aware of the huge selection but am a rather slow reader and tend to spend valuable time reading things I find appealing (which usually means I'm looking at things not specifically categorised in the paranormal romance section), I'm not sure if my opinion of what's out there is 100% correct. So please - spam me with details of vampire-related books you know/have read & I'll be eternally grateful. Thanks! I'm being rushed and dragged off of here, so I just wanted to quickly let everyone know I'll be most likely absent for the next two weeks as I'm house-sitting my cousin's place and have NO IDEA if I'll have internet access. If anything astounding happens leave me a message on this post. I shall be absent from the net for the next almost month, so to anyone who feels that I will be missing anything important please leave me a comment on this post (because, as vainly as I will try on my return, I don't know how long it will take or if I will be able to read the many many pages of LJ posts when I come back). I have booked my seats (I think I'm fairly happy where I've got!) and my bag is mostly packed as I have to leave tomorrow morning for an early afternoon flight. 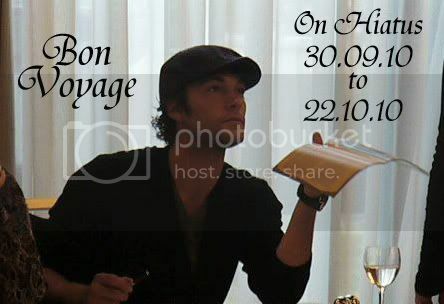 Kyle Schmid (at Ringcon) and books (ie. the Grimms brothers/Fairytale Road road trip, and getting yet more ideas for my own series). I shall return with a multitude of pictures & lengthy posts (and you just know between me and canadian_turtle a fair bit shall be covered!) so see you all on the flip side if I do indeed survive my encounter meeting the hottest go (IMO) on the planet. I was attempting to vid the characterisation around Henry but I'm not sure if the spin I was putting on this had to do with a certain other character of mine. Heh. Anyways, this has primarily come about because I'm going to hopefully see Kyle Schmid (the actor who plays Henry) next month and I had a dire need to pull a tribute together for his character and the many hardships he's had to go through in the current day, and basically that the only person he can rely on through all this is Vicki. 3rd-Sep-2010 07:40 pm - Livejournal's new "feature"
Well I am about to run out the door so this is my official AWAY NOTICE. No time to pretty it up. Going to the USA - back in 3 weeks y'all! Just a quick note to apologize for my total lack of being around - work has been cracking the whip hard this week (early starts, late finishes, and bringing work home!) and I've still not got everything done. I'm leaving at like 6:30am tomorrow morning to fly to QLD for 4 days. By then I'll probably have 2 weeks of stuff to catch up on, and even then I won't be able to as it'll be more of the same b4 shooting over to the US for 3 weeks. In other words I will FAIL at being part of the world (& your lives) for July/August so don't be surprised if I don't know anything. This journal won't be seeing any real action for some time. Please take this as my away post. Well I haven't done one of these in a while, but it appealed to me. 1. What do you feel is the most important quality in a close friend? Trust. Above all else you need to trust that they won't betray, that they won't turn their backs on you, that they are there for you - it's the only real way you can love them for it. 2. What is the one quality in a stranger you'd just met that would make you want to get to know them better? Understanding. The more understanding they are the more open I am with them as I know they know what I'm talking about and actually have a care. 3. What do you think is the most important quality in a good leader? Knowledge. If someone knows what they're doing, where they are going, can be relied on to make decisions and will not make an error, then that is a good leader to me. 4. What is the one thing that makes a child likable to you? 5. What do you think is the one thing that makes a good parent (other than loving their children)? I know I have a million and one things to write about, but I'm just going to quickly post about the Star Trek premiere in Sydney last night. To be short-but-sweet it was a balmy night with very little crowd, which was surprising as we were a little late but still about 2 hours early after being kicked out of the hotel. The guys spent nearly an hour down at the start of the red carpet signing autographs and speaking to various people. Zachary Quinto spoke to Richard Wilkins for a good 15mins (all of which 2 mins of this was aired and only about the Leonard Nimoy thing which everyone has heard about already surely)and then he went BACK to him and we were all "Zach, c'mon!" He was Billy Boyding that carpet, really. Not a single person missed out down there I don't think. Which made for very limited time for us on the stairs - he didn't reach us until about 6:30pm, and what was worse was that a SWARM of ppl came up the stairs at that point in time engulfing all of them. I have to say Eric Bana walked the carpet the smartest of them all (and his wife was gorgeous to boot - we were all fangirling her dress but none of us knew her name so we could call her over and tell her!). But back to the stars... Karl Urban was fantastically attentive to everyone. Zach seemed to be enjoying himself for the most part down the bottom, Chris we could barely see, and poor John Cho got ignored by most people. We were fully focused on Zach so when we saw him coming (and the crowd beginning to swallow him) all 5 of us - me, Zarina, Gen, Sherrie & Jess - shouted "ZACH!" (not to mention we had the aided help of a German guy called Christian who was there more just to chat with us than for the stars LOL). This was enough to grab his attention, and we kept calling and waving him over so he could locate his fanbase. And then once he was over there was a million and one things blurted out, but I do remember that we all practically pointed at Zarina and went "ZARINA!" and he threw his arms out (seriously, I thought he was going to hug her for a minute there!) and said "I met you in Paris! In France!" and we were all rejoicing the reunion of Zacharina! LOL Gen & Zarina had 2 missions - the first completed, the 2nd was to try and organise to give him his present (they had spent the day gathering very daggy Australian souveniors for him) but he was being pulled away *queue video* and only returned long enough to get photos with Gen, Zarina & Jess before racing off (sad I was, I missed out *sob*). This is my official notice of absence. Unfortunately I was only just told what was happening and between school and work I will not be here for when our phone line shuts down so I cannot create any pretty graphics or the like. Please leave me any important info about what's going on with you guys (or the world I love in general) in comments to this post. For my best buddies who have my mobile - you can still reach me on that if needed. I may text a note or two to Twitter if I'm seriously bored. I will let you know if I come back earlier - and can someone please keep an eye on Twicon for me and let me know if the world hates me and Jackson's photoshoot, etc. go on sale while I'm off? Thanks. Summary: In 1692 a group of witches sacrificed their powers to prevent death. Almost 3.5 centuries later, these powers have befallen new generations. Those that would be heroes are lost. It is up to those who are left behind to save themselves & the world they're in. Author's Notes: Probably another 5-6 chapters to go on this.